James Black, Jr. at attention. Riding on his incredible wave of popularity from the movie, “Brooklyn Castle,” James Black, Jr. recently attended the U.S. Chess School founded by IM Greg Shahade. GMs Alejandro Ramirez and Aleksandr Lenderman took part as instructors. Players like Black, Arthur Shen, Deepak Aaron, Christopher Gu and Luke Harmon-Velotti were among the players attending. Shahade, also the U.S. Chess League founder, has decided to create a format to provide the most talents U.S. juniors with access to GM instructor and the study rigor to shore up specific weak areas. After a disappointing showing at the U.S. Cadet, this may be what will bring Black to the next level. In the 80s and 90s, emigres from the former Soviet Union started to enter the U.S. and proceeded to dominate for 20 years. It appears that this era is coming to and end and a new generation of native-born talent is being developed. With the success of national team members Hikaru Nakamura, Robert Hess and Ray Robson, the U.S. seems to be bursting at the seams with a wave of 21st century talent. Players like newly-minted Grandmaster Marc Arnold, and International Master Daniel Naroditsky as well as the up-and-coming Josh Colas and Justus Williams means that the future seems bright. Black is also in that number and hopefully this opportunity will help him reap the fruits of his labor. 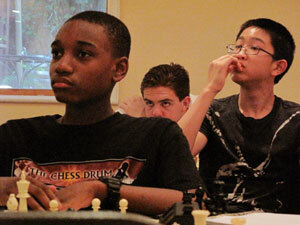 With scholastic chess booming and “Brooklyn Castle” guaranteed to bring positive exposure (and perhaps funding), chess may be in for another boom. I was wondering where’s James, winner of at least two Nationals! It’s Good to see him. I hope he doesn’t get frustrated. He works so hard. Hi Daaim, it has been a while. I just wanted to ask you, why would James get frustrated? He loves chess! We all love chess and sometimes we get frustrated… it’s part of the game. James Jr. has had a few results lately that were not indicative of his training and strength. It happens. I remember Hikaru Nakamura going through his recent slump. He was tweeting so many comments showing intense frustration. He is climbing back. When I saw the video on James some time ago, I was impressed with his work ethic. It brought flashbacks of my own time when I studied 6-8 hours on chess. Those were joyous times of self-exploration. With James’ work ethic it is a matter of time before he finds the balance in his training methods and starts his climb. I spoke with James Sr. and he told me James Jr. is doing well. He’s adjusting to H.S. He will be starting to play again, soon, maybe next month along with Josh in a major year-end norm tournament.